Posted on 21st November 2014 by penny Posted in Penny's Kitchen	. Place 2 Tbsp. oil in a wok or large frying pan over medium to high heat. Add garlic, galangal (or ginger), green onion, and chili. Stir-fry until fragrant (about 1 minute).Stir-frying Tip: Add a little water to the wok/pan when it gets too dry instead of more oil. Add cabbage, mushrooms, and tofu (or shrimp). As you stir-fry, add the sauce. Stir-fry 1-2 minutes, until vegetables have softened. Remove from heat and add bean sprouts, tossing to mix in. Then do a taste test for salt, adding a little more fish or soy sauce if not flavorful enough. To assemble rolls, lay spring roll wrappers on a clean working surface. Place one heaping Tbsp. of filling on each wrapper (if using large wrappers, you will need more). Spread filling along the width of the spring roll wrapper – you’ll want to do this 2/3 of the way down, closer to you so you have room to roll it. Try not to include too much of the liquid left from the wok/pan (a slotted spoon works well for this). Sprinkle some of the fresh coriander and basil over the filling. Then fold the left and right sides of wrapper over filling. Lift up the end nearest you and tuck over, rolling upwards. Secure by dipping your fingers in some water and wetting the end, “pasting” it shut. To fry spring rolls, place some oil (about 1 inch deep) in a wok or deep-sided frying pan over medium-high heat. When oil begins to form snake-like lines across the bottom of the pan, the oil is starting to heat up. To test it, dip one corner of a spring roll into the oil. If it begins to sizzle and cook, the oil is ready. Using tongs, place spring rolls in oil, allowing them to fry about 1 minute on each side. Spring rolls are done when they turn light to medium golden-brown (see photo). Place on paper towels (or a clean dish towel) to drain while you finish frying the rest. Tags: spring rolls, thai snack	. Bring a large pot of water to boil. Dunk in noodles and boil until they are limp but still firm and a little “crunchy” to taste. The noodles should be undercooked, as they will be fried later. Rinse with cool water and set aside. Toss shrimp in 1 Tbsp. soy sauce and set aside. Next, combine ‘Pad Thai Sauce’ ingredients, stirring to dissolve sugar. Set aside. Warm a wok or large frying pan over medium-high heat. Add 2 Tbsp. oil and swirl around, then add garlic and ginger. Stir-fry 1 minute and add the shrimp. Stir-fry 2 minutes, or until shrimp are pink and plump. Push ingredients aside and drizzle a little more oil into the pan. Crack in the egg and stir-fry quickly to scramble (30 seconds). Add noodles and drizzle over 1/3 of the pad Thai sauce. Using a gentle turning motion, stir-fry everything together. Add more sauce every 30 seconds to 1 minute until sauce is used up and noodles begin to get sticky and chewy tasting (‘al dente’ – 5 to 8 minutes). Turn off heat. Fold in bean sprouts and green onion (note: beansprouts and nuts can be served alongside the noodles if desired). Taste-test, adding more fish sauce if not flavorful enough. If too salty or sweet, add a good squeeze of lime. Sprinkle over the nuts and coriander. Thai chili sauce can be served on the side for those who like it extra spicy. Posted on 20th November 2014 by penny Posted in Penny's Kitchen	. Place all the “green curry paste” ingredients together in a food processor, and process to a paste. If necessary, add a few Tbsp. of the coconut milk to help blend ingredients. Set aside. Warm a wok or large frying pan over medium-high heat. Add the oil and swirl around, then add the green curry paste. Stir-fry briefly to release the fragrance (30 seconds to 1 minute), then add 3/4 of the coconut milk, reserving 2-3 Tbsp. per serving portion for later. Add the chicken, stirring to incorporate. When the curry sauce comes to a boil, reduce heat to medium or medium-low, until you get a nice simmer. Cover and allow to simmer 3-5 more minutes, or until chicken is cooked through. Stir occasionally. Add the red bell pepper and zucchini, plus the strips of lime leaf (or lime zest), stirring well to incorporate. Simmer another 2-3 minutes, or until vegetables are softened but still firm and colorful. Do a taste-test for salt, adding 1-2 Tbsp. fish sauce if not salty enough. If you’d prefer a sweeter curry, add a little more sugar. If too salty, add a squeeze of lime or lemon juice. If too spicy, add more coconut milk. Note that this curry should be a balance of salty, spicy, sweet and sour, plus bitter (the bitter is found in the fresh basil garnish). Serve this curry in bowls with Thai jasmine rice on the side, allowing guests to add their own. Top each portion with fresh basil, then drizzle over 2-3 Tbsp. coconut milk, and ENJOY! Tags: thai green curry	. First toast the bread just a little bit – if this step is overlooked, then the bread might become too mushy (yes mushy is a very technical term). Spread 1/2 Tablespoon of peanut butter on each slice of bread. 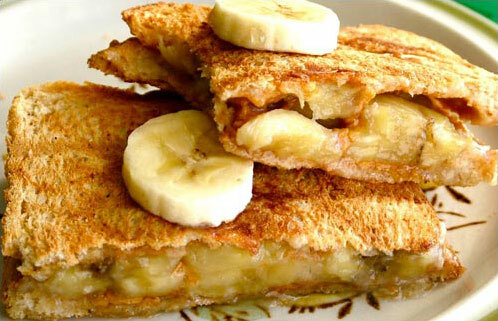 Cut the banana into slices – however big you so choose (I cut mine about a quarter of an inch thick). This would be a good time to turn on your grill. You could also griddle or fry this sandwich, but grilling is the healthiest route (you will find I usually take the healthy route). While your heat source is doing it’s thing- drizzle honey over the two slices of peanut butter bread. Tags: breakfast, thai cuisine, thai food, thai recipes	. Posted on 19th November 2014 by penny Posted in pennyhome	. Penny’s is located just 2 hours South East of Bangkok on the Gulf of Thailand in the sleepy town of Ban Chang. Ban Chang benefits from having nice beaches, good weather all year round and peace and quiet! If you crave action we are just 30 minutes from either Pattaya or Rayong and all the attractions these cities have to offer such as historic temples, Floating market, zoos, water parks, bars cinemas and nightlife! Ban Chang has it’s fair share of attractions and has many Western style bars and restaurants, as well as famous beach side seafood restaurants! From Bangkok: take Highway 7 or the Chonburi Expressway. After travelling about 90 minutes you should reach the Pattaya turnoff. Instead, head towards Rayong along Route 36. After travelling approximately 15 minutes you will reach some traffic lights. Turn right at the lights and head down the 3376. This windy country road will pass St. Andrew’s School. After 20 minutes it should deliver you to Penny’s which is about 3km past the 711 on the left hand side tucked in tesaban Soi 4. If you get stuck, head for the imposing Ban Chang Palace Hotel on the left hand side and call us, we will pick you up from there! Leaving Ban Chang, it is possible to take a large air-conditioned bus to Mo Chit (direct 200 baht every hour) or a minibus to Bang Na (also around B200). It is also possible to fly to Samuii and Phuket from our local Pattaya Airport (just 20 minutes away!) We are less than 90 minutes from Bangkok Suwanapoom Airport. There are also many buses onwards to Rayong, Koh Samet and Koh Chang as well as many buses up country. While you are with us we can arrange taxi or vehicle hire for you to enable you to see all the sights. We can also clean and service your car, we have a fully equipped garage. Tags: pattaya, penny's map, silverlake	. Wonderful staff, relaxing natural setting. My wife and I loved our stay at Penny’s. From the moment we drove in, we were welcomed like family. There is no pretense to this place or the folks who run it. We spent a wonderful two days, relaxing, swimming–in a great pool, and talking with a couple we met from Sweden and of course with Penny and Eddy. This is a fairly new venture for them and they have plans to perhaps slowly expand it a little. What seperates this experience from others is the family atmosphere. Sort of like a Bed and Breakfast experience but you have your own little cottage like room. Its close ( 10 mins or so from the beach areas of Ban Chang) there are all sorts of local places to pick up food, and supplies. The price for Penney’s is quite reasonable! I think they are constantly trying to improve the facilities and the experience for the people and so I am sure this place will be even MORE of a great experience as time goes on. We appreciated very much Eddy and Penny and we will be back! We – my 18 year old daughter, my girlfriend and me – stayed for 2 nights, and there’s absolutely no doubt in my mind that I will be back. It’s not 5 stars, but there’s nothing to put your fingers on, and Penny herself lifts the place to a level, where the much higher rated hotels I stayed on, can’t keep up. Penny makes sure that everything is to your satisfaction – with a big smile. I’ve never felt more welcome any of the many places I’ve stayed in Thailand. It’s placed in a quiet area, but still not far from town. And with the low numbers of rooms, there’s a good chance you have the place for yourself.I have found my home away from home when I’m in Ban Chang. We had a great time relaxing by the pool and exploring places by motorbike,we will be back someday for sure. WOW! Warm friendly lovely people at Penny’s !!!! Great warm welcone, super clean and confortable rooms great facilities and delicious food. Penny was warm and inviting abd took very good care of us. The new rooms are very nicely decorated and VERY CLEAN. They have internet TV, Wifi, DVD and free movies, even Wii for kids! Pennys is a Homestay and not a big hotel which we liked because we had the place to ourselves. We rented bikes and enjoyed cycling to the beach. The food was very good value and the breakfast delicious. We felt very welcomed at Pennys it has plenty of things for the kids to do and the Homestay and Gardens are a labour of love for the hosts. We will recommend to all our friends in Bangkok. Thank you for an unforgetable stay! TIP: Pennys has a small number of rooms and often booked up so you need to book ahead! Extea beds can be negotiated on the spot they are very friebdly, also small pets are welcome! Penny’s Resort is located at the end of a private road just outside town so is both quiet and tranquil. We have secure covered parking facilities on site and facilities are securely locked and watched over by our security guard every night. In addition your car can be washed, cleaned and even serviced by our staff while you stay! We have two newly constructed bedrooms available for guests. Both are air-conditioned double rooms. The rooms are quiet and there is plenty of closet space and a safe for your belongings. The rooms have individual on-suite private toilet, bath and hot water shower facilities and adjoin a large living room where you may enjoy Internet TV, broadband, DVDs and a small library of books and magazines. We also have tea and coffee making facilities, fridge and minibar. Washing, drying and ironing services for your clothes are available and Panny’s has an exellent menu. Bikes and motorbikes are available for hire and the beach is just 10 minutes away. Mail us for availability and prices: pennyplaza@gmail.com. prices start from Baht 900 day including use of our outstanding facilities. Located in the sleepy town of Ban Chang, Penny’s Resort is 30 minutes drive to Pattaya City and all it’s attractions, such as wildlife parks, tiger zoo, mini golf, golf carting, botanical gardens, cinema, shopping malls and floating market. There are too many attractions to list! In addition, Ban Chang has many local attractions, such as a large Vineyard (Silverlake), a huge Golden Buddha carved into a mountain, many temples, a Long Neck village, elephant trekking, ATV park and a Chinese museum. There are also many quiet and clean beaches around Ban Chang and many islands that can be explored from local Sattahip Fishing Village, such as a turtle Sanctuary. Ban Chang has a good selection of restaurants and bars and there is a great variety of food on offer. You can enjoy German, French, Italian, Japanese, Steak and traditional English food as well as great traditional Thai food. At Penny’s we can offer you home cooked food and specialty spicy Thai Issan dishes, as well as traditional Western food such as cakes, pies, pasta and the traditional English Breakfast! Ban Chang has a large Tesco supermarket, food halls and plenty of markets to explore shopping and many places selling traditional Thai ‘Khanom’ sweets. You can also enjoy visiting the many fishing parks, golf courses, parks and temples and enjoy interacting with the local people who are very friendly! Should you wish to enjoy the nightlife, Ban Chang has nightclubs, Western ‘pubs’ and Thai style karaoke bars as well as coffee shops and live music open well into the night! Local Pala Beach is pictured below. It boasts a quiet temple and traditional fishing village, with a long sandy beach where you can eat locally caught seafood and enjoy the uninterrupted scenery. Tags: homestay, pattaya, penny's, rayong, sattahip, ฺฺิBanchang	.